Fits: XUV, HPX Gator Utility Vehicles with ROPS through 2012 year models, will NOT fit 2013 and newer. 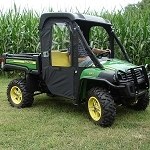 Economical & Versatile HPX & XUV Gator Utility vehicle soft cab windbreak enclosure. This windbreak enclosure features hinged doors and zip down side windows. Special care must be taken during installation so you do not dent or bend the front and rear window material. This enclosure system comes with detailed instructions with photographs for reference. Allow yourself two to three hours for installation. This enclosure can be removed for summer use and put away for storage if desired. This enclosure carries a one year warranty. It is made of 13 Oz. Rip Stop Vinyl. The front windshield material is Lexan and the side and rear window is made of clear vinyl. 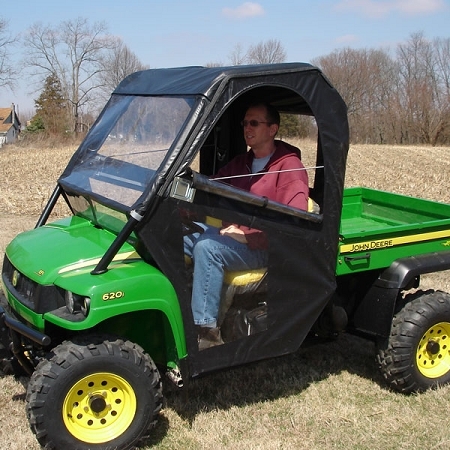 This windbreak enclosure is not compatible with the poly roof or the poly windshield available from John Deere. This windbreak enclosure is not a genuine John Deere item. It is manufactured by Original Tractor Cab Company in the USA.